This evocative and haunting drama, set in a rubble-strewn Berlin in 1945, is like no other film about post–World War II Jewish identity. After surviving Auschwitz, a former cabaret singer (Nina Hoss, in a dazzling, multilayered performance), her face disfigured and reconstructed, returns to her war-ravaged hometown to seek out the gentile husband who may or may not have betrayed her to the Nazis. Without recognizing her, he enlists her to play his wife in a bizarre hall-of-shattered-mirrors story that’s as richly metaphorical as it is preposterously engrossing. Revenge film or tale of romantic reconciliation? One doesn’t know until the superb closing scene of this marvel from Christian Petzold, perhaps the most important figure in contemporary German cinema. A person's sense of identity can be shaped by several factors, both internal and external. Our outward appearance, personal relationships, and emotional psyche all have a part to play in how we ultimately define ourselves -- but what happens when all of those elements are shattered beyond recognition? A striking tale of lingering trauma and stumbling rebirth, Christian Petzold's 'Phoenix' focuses on a protagonist forced to rebuild herself or leave her fractured pieces behind in the rubble. After her face is badly disfigured in a concentration camp, Nelly (Nina Hoss) undergoes reconstructive surgery and struggles to adapt to postwar life in 1945 Germany as a Holocaust survivor. Seeking to reclaim her past life, she reunites with her estranged husband, Johnny (Ronald Zehrfeld) -- but her gentile spouse no longer seems to recognize her. Even more, she discovers that he may have betrayed her to the Nazis during the war. Faced with conflicting desires, Nelly forges a precarious partnership with the man -- one that could lead to possible reconciliation or revenge. Physically and emotionally broken with bandages masking her wounded face, Nelly barely exists as a character when we first meet her. To this end, the film essentially becomes a slow-burn examination of her gradual rebirth, and actress Nina Hoss layers this transformation with powerfully conflicting emotions. Initially little more than a walking ghost, Nelly slowly tries to rebuild her old identity, and watching Hoss methodically rekindle the light in her eyes leads to a very affecting performance. This on-screen resurrection is primarily fueled by the twisted relationship that forms between Nelly and her pre-war husband. Though unaware of who she really is due to her facial surgery, Johnny still notices her strong resemblance to his wife, leading to a rather unsettling scheme that strongly evokes similar beats from Alfred Hitchcock's 'Vertigo.' Probing deep into multi-faceted themes of identity, dependence, denial, trauma, love, vengeance, and healing, this simultaneously troubling yet tragically romantic coupling becomes the heart of the film's drama. As Johnny essentially reconstructs Nelly before his eyes, he still seems unable (or unwilling) to accept the truth, layering their interactions with complex ambiguity while keeping audiences on their toes, always waiting for the other shoe to drop. At the same time, Nelly relies on his flashes of recognition to help spur her own emotional resurgence, effectively defining herself as he perceives her. She thinks that if he can see her as she was, then perhaps she can finally be that person again -- inside and out. Of course, this level of dependence can only go so far, and whether or not the woman is capable of redefining herself on her own terms, becomes paramount to the film's conclusion. Visually, director Christian Petzold and cinematographer Hans Fromm create a moody noir aesthetic that perfectly complements the narrative's gently mysterious and somber air. Shadowy lighting is joined by striking uses of color, layering the dark war-torn streets and neon-lit Phoenix cabaret club where Nelly and Johnny first reunite with a faintly otherworldly quality. Stark yet potent in style, the filmmakers use painterly compositions and economic cuts to draw out tension, while wider shots help to enhance the protagonist's alienation and internal distance. The film's final shot is also particularly noteworthy, using a shift in camera focus to punctuate Nelly's journey with understated beauty. Deeply metaphorical in its storytelling without sacrificing intimate emotion or suspense, 'Phoenix' addresses Jewish-German identity with powerful allegory and haunting drama. An unconventional examination of post-war trauma and a tragically twisted tale of condemned romance, the film becomes a thought-provoking character study steeped in Hitchcockian shades of noir. 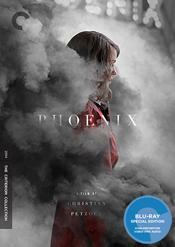 Criterion presents 'Phoenix' on Blu-ray in their standard clear keepcase with spine number 809. The BD-50 Region A disc comes packaged with a pamphlet featuring an essay by critic Michael Koresky. The movie is provided with a 1080p/AVC MPEG-4 transfer in the 2.39:1 aspect ratio. Impeccably shot and free from any technical issues, this is an absolutely stellar video presentation. The 35mm source is in pristine shape with a light layer of natural grain preserved, offering a subtle sheen of filmic texture. Clarity is strong, providing intricate fine details throughout the movie's war-torn sets and across the character's many frequently distraught faces. Depth is also impressive, leading to a life-like sense of dimension, especially in brighter outdoor scenes. Saturation is also richly rendered, mixing shadowy lighting with bold primaries to create a moody noir aesthetic bathed in potent splashes of color. Contrast is high with bright whites and deep, inky blacks that don't crush. Thankfully, there are no artifacts or signs of digital compression. Marked by powerful cinematography, 'Phoenix' comes to Blu-ray with a demo-worthy video transfer. The film is presented with a German DTS-HD MA 5.1 track and English subtitles. Subtly immersive, this is a nicely layered and balanced mix. Speech is clear and well prioritized throughout, giving every whispery line of dialogue room to breathe. The soundstage is delicately expansive, spreading effective ambiance around the room with solid surround use, fully bringing the postwar setting to life. Footsteps, doors, ringing phones, ticking clocks, and birds all add a quiet but deliberate sense tone to each scene and location, enhancing the story's somber and mysterious air. Passing cars pan from speaker to speaker with smooth imaging, and rumbling trains carry solid LFE cues. The bustling Phoenix Club is especially noteworthy for its convincing atmosphere, and the movie's musical performances and jazzy score come through with strong fidelity and range. Subdued but textured, the mix creates an engaging mood that perfectly complements the cinematography's noir aesthetic. Criterion has put together a solid collection of supplements. All of the special features are presented in 1080p with Dolby Digital 2.0 audio and English subtitles for the foreign language portions (unless noted otherwise). Christian Petzold and Nina Hoss (HD, 26 min) – Presented in 1080i, this 2016 interview features the director and actress as they discuss their continued collaboration with each other. The pair share details on their first meeting, use of related themes and characterizations, approach to Nelly, and intentions for certain scenes, rounding out a great conversation about the director/actor relationship. Hans Fromm (HD, 13 min) – This is a 2016 interview with the cinematographer. Fromm elaborates on the film's noir visual style, his working relationship with the director, lighting, lenses, and other visual touches. The Making of 'Phoenix' (HD, 21 min) – Here we get a 2014 behind-the-scenes doc with cast and crew interviews, and on-set footage. The participants discuss locations, themes, recreating postwar Germany, production designs, characters, and accomplishing specific scenes. Trailer (HD, 2 min) – The film's trailer is included in 1080p with Dolby Digital 5.1 audio. 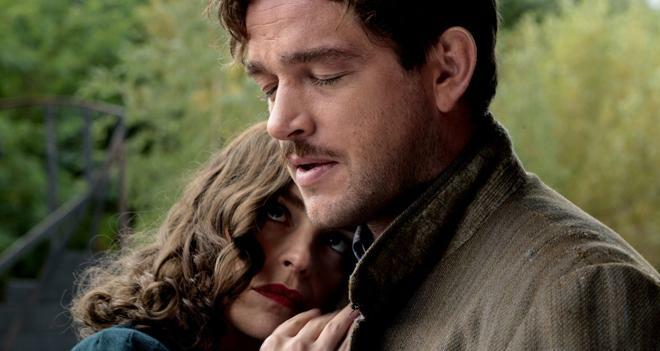 Christian Petzold's 'Phoenix' is a haunting drama about identity and rebirth. Fueled by striking noir influenced visuals and a devastating performance from Nina Hoss, the movie leaves a lasting impression. On the technical front, the video transfer is demo-worthy and the audio mix is very strong, fully preserving the filmmaker's absorbing style. Though not packed with special features, the included interviews and making of doc are very worthwhile. The heavy subject matter won't be for everyone, but this is a powerful film and a great release. Highly recommended.